A July 8 article in the Sun-Sentinel by Juan C. Rodriguez asked, “Is Justin Ruggiano the next Marlin to go?” The same things that made him desirable to Miami made him desirable to contenders. He was versatile, he could hit a little bit, he was inexpensive, and he was under team control. The Marlins might’ve been motivated to move him on account of their upcoming outfield prospects. The Marlins additionally might’ve been motivated to move him on account of being the Marlins. It made sense to ask the question about Ruggiano, but the trade deadline came and went, and Ruggiano stuck. He made an appearance for the Marlins just Sunday. Another thing about this past July 8 — that’s the last day Justin Ruggiano had a hit. In the fifth inning of a game against the Braves, he singled to left off Mike Minor. It was a liner, and it drove in a run. Sunday, Ruggiano pinch-hit and faced Minor, and he grounded out. His hitless streak is alive, and it’s up to 42 at-bats. Ruggiano doesn’t have a hit in more than a month. He’s not a starter anymore, but he’s still on the team, playing sometimes, and he probably can’t remember the last time he had fun playing. This streak is approaching a record, and to Ruggiano, it feels like it. “I don’t have anything to say so, obviously, that’s how I’m dealing with it,” Ruggiano said Sunday when asked how he was coping with the long drought. Ruggiano doesn’t have a hit in 42 consecutive at-bats. The all-time record for a non-pitcher is 46 at-bats, and that belongs to Eugenio Velez, that history having been made in 2011. The all-time record for a pitcher is, I don’t know, something, something presumably longer, but that should hardly count. Generally speaking, records become less and less interesting the more qualifiers you add, but it only makes sense to compare a non-pitcher to non-pitchers. Ruggiano could be a few days away from one of the ugliest records one could possess. A year ago, Ruggiano played in 91 games for the Marlins, batting 320 times. This year, Ruggiano’s played in 91 games for the Marlins, batting 327 times. His wRC+ this year is exactly half of last year’s 146. That’s part of what makes this so interesting — Ruggiano, in the past, has been able to hit. He owns a career .291 average in Triple-A. From his debut with the Marlins to the start of this slump, he batted .271 with an .810 OPS in about 600 trips to the plate. Ruggiano was looking like a valuable asset, up until he became the least productive hitter in the league. He was someone contenders wanted to trade for, and someone his own team didn’t want to trade. Velez? Velez is bad. Not a hitter. Ruggiano was a hitter, and hitters get hits. As Ruggiano returned to the Marlins dugout, he offered to Jason Heyward a tip of the batting helmet. At that point, his hitless streak spanned one at-bat. Were that to happen again today, Ruggiano’s helmet would probably do something else. I don’t know if there’s really such thing as selfish baseball — what’s good for the individual is good for the team — but right now Ruggiano probably cares more about getting a hit than he cares about his team winning a game. Everything else can go back to normal after Ruggiano goes back to normal. Of course, something like this can’t exist without controversy. Ruggiano already had an extended hitless streak when the Marlins faced the Brewers on July 21. 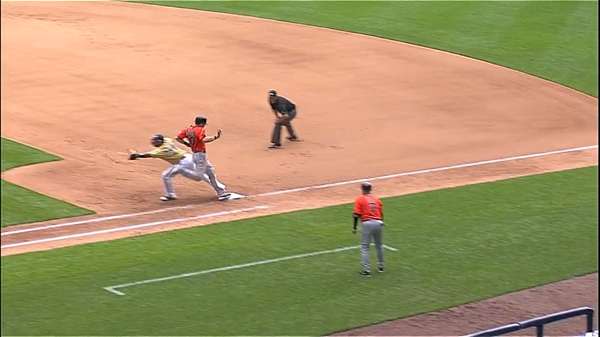 Against Wily Peralta in the third, Ruggiano flew out. Against Peralta in the fifth, he walked. Against Peralta in the eighth, he put in play a swinging bunt. Ruggiano, probably, had himself an infield single, and as we’ve already established, it’s not like Ruggiano is holding out for a solid line drive. Since this grounder, Ruggiano’s gone 0-for-17. I don’t know if Velez’s streak included a similarly questionable call, but Ruggiano, at least, has a screenshot on his side. Even if he does set a new record, he’d know with a high degree of certainty he doesn’t deserve it. Maybe that actually makes things worse. There are a few things working for Ruggiano. One is the above — the fact that, during his hitless streak, he probably had a hit. That, if nothing else, merits an asterisk. Two, Ruggiano still has a few more tries before he goes in the history books. If he can get a hit in one of his next three at-bats, he’ll avoid tying Velez. Just based on his .246 career average, he has a 57% chance of getting that hit. Three, Velez’s streak isn’t actually officially over. Velez’s 46th consecutive hitless at-bat came on September 28, 2011. He hasn’t had a major-league at-bat since, and he’s only 31. He’s posted a .399 OBP this year in Triple-A as a utility type, and he might extend that streak yet. Even if Ruggiano does blow past 46, Velez might someday catch up. It’s not all bad for Justin Ruggiano, is the point. But it surely feels like it is. And, a year after feeling like he established himself, Ruggiano has to be wondering. Failure can do unspeakable things to the brain, and Ruggiano might not remember what it feels like to not fail at his job. Snapping this streak isn’t going to get any easier. We hoped you liked reading Justin Ruggiano and Continuing Failure by Jeff Sullivan!